Businesses that trade securities on public exchanges, as well as those in regulated industries and the government sector, face complex and changing regulations for financial and budgetary reporting. Taxes, currencies, international and localized regulations, and internal control requirements add to the challenge. Technology requirements for regulatory filing are also mandated, as with the US Securities and Exchange Commission’s requirement to file in a standardized file format (XBRL). 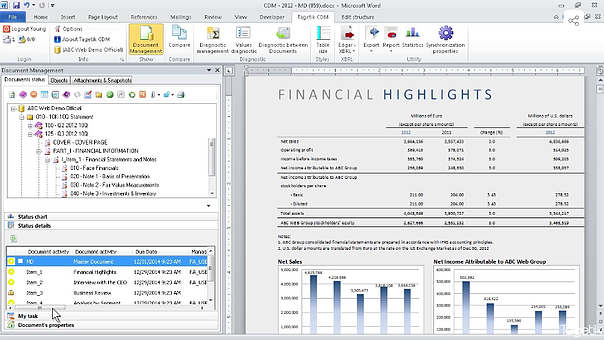 Disclosure management technology can radically transform annual financial reporting process, bringing efficiency, order and control to what is often regarded as a somewhat haphazard and manual process characterized by multiple stakeholders, file formats, documents, outputs, applications and a heavy reliance on personal productivity tools, like MS Office. It can provide a secure environment in which multiple participants with different roles and responsibilities across many different departments can collaborate in the controlled assembly of complex outputs and filings yet continue to work independently. Neubrain Annual Financial Reporting Solution, powered by Tagetik® Collaborative Office software, is a secure, collaborative, enterprise-scalable reporting and process automation solution that enables users to merge enterprise data with focused narrative analysis in a controlled, auditable environment. It automates the collection of any and all data in a single, dynamic reporting and analysis solution. Multiple participants in different departments can collaborate in the assembly of complex reports, working independently while ensuring that proper controls and approvals are in place. The solution provides integrated tagging to use on various regulatory filings and can create extension taxonomies with pivot based navigation for easy review.